Double up on free Dumplings! 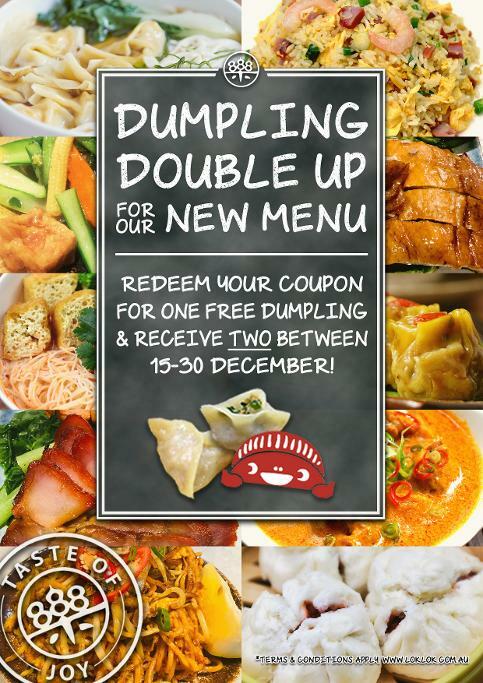 It's time to share our new menu with you, and to celebrate, we're offering you the opportunity to redeem a coupon for one free dumpling and receive TWO instead! Don't wait any longer to try the delicious handmade dumplings on offer at Lok Lok! A. This offer is not redeemable for cash. B. 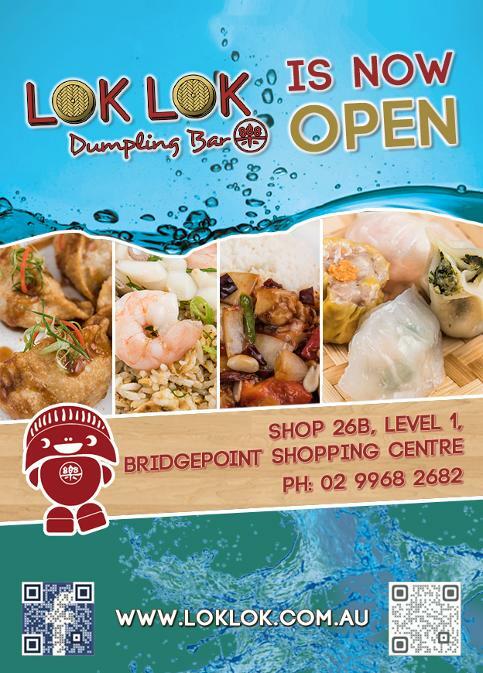 A customer must present a free dumpling coupon distributed by Lok Lok Dumpling Bar in Bridgepoint Shopping Centre. Substitutions may be refused at the discretion of Lok Lok Dumpling Bar. C. Offer must be used in one transaction. D. Cannot be used in conjunction with any other offer, discount or voucher. 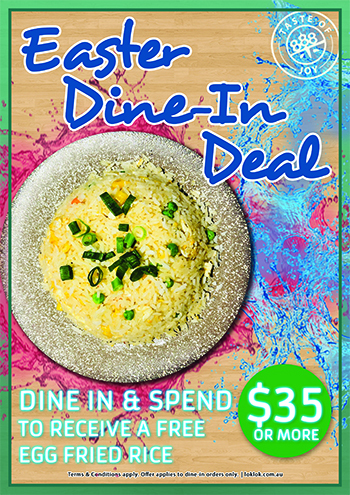 E. Valid only at Lok Lok Dumpling Bar, Bridgepoint Shopping Centre. F. Offer may be subject to availability. G. These terms and conditions may be subject to change without notice. H. Lok Lok Dumpling Bar reserves the right to all final decisions made. We all get tired of eating the same thing each day, even if it's something delicious, so to offer you a bit of variety, Lok Lok Dumpling Bar at Bridgepoint Shopping Centre is offering an all new Lunch Specials menu just for you! You can still pair your choice with the Soup of the Day for $13.90, or trade the soup for Egg Fried Rice or Fried Noodles for $2.00 extra. B. A customer must choose a dish from the selection provided to activate the offer. Substitutions may be refused at the discretion of Lok Lok Dumpling Bar. 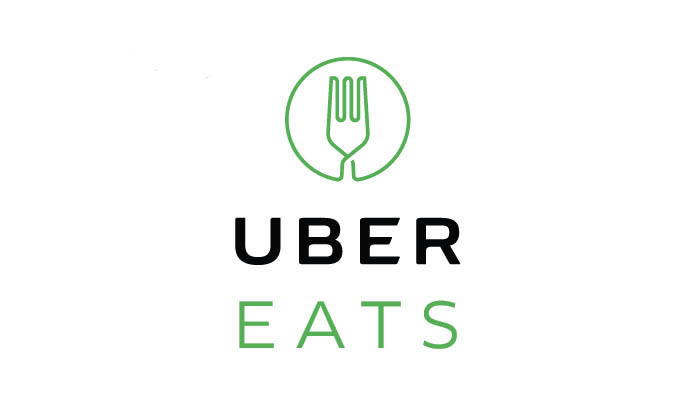 Have you been searching for a quick, easy and delicious option for lunch? 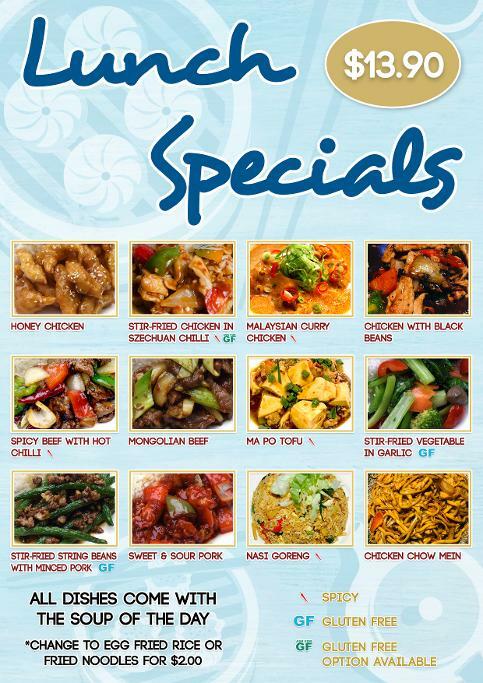 Look no further, Lok Lok Dumpling Bar at Bridgepoint Shopping Centre is offering an exclusive lunch deal for you. 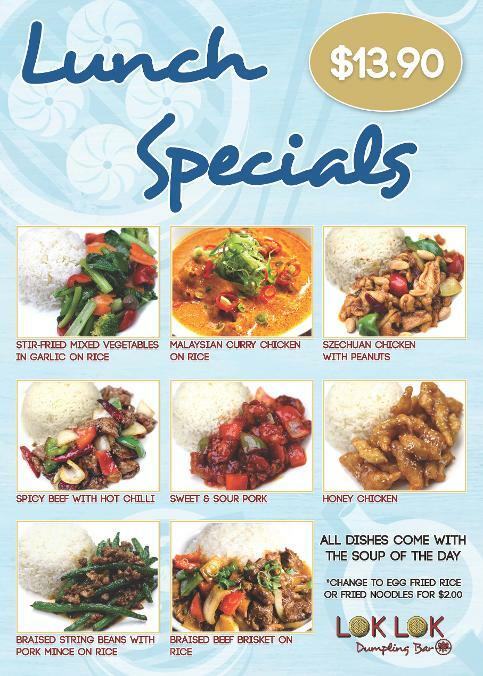 Choose one of eight hand-picked options, and pair it with the Soup of the Day for only $13.90, or trade the soup for Egg Fried Rice or Fried Noodles for $2.00 extra. The Lok Lok team is so excited to meet you and serve up your favourite dumplings at our brand new location. You can find us at Bridgepoint Shopping Centre on Level 1, opposite the glass elevator near Aldi. Visit us on Monday to Saturday from 10:30am to 8:00pm, or on Sunday from 10:30am to 7:00pm for brunch, lunch or dinner. © Copyright Lok Lok Dumpling Bar 2019. All rights reserved.